John Kricfalusi has just posted an interesting piece on the use of dog-nosed faces on otherwise very human cartoon characters. This is a phenomenon mostly found in Disney's "Uncle Scrooge" and Donald Duck" comics illustrated by Carl Barks, although it's been seen in animation as well, like Nelvana's "Rock and Rule", for example. I agree with John that this type of character is rather off-putting, as it is neither distinctly human nor typical of the "Funny Animal" type of cartoons so prevalent in animation and comics. Though the Carl Barks dog-nosed characters are rather benign, this trend also begat the "Furry" movement, which usually also seems to have a sexual bent to it in the art of its many practitioners. At this very point in time, I am coincidentally covering the topic of "Anthropomorphism" in my Character Design course at Sheridan College, so I'd like to take this opportunity to address the distinction between "Funny Animals" and "Furries". Some time ago, I'd posted this piece on "Four Degrees of Anthropomorphism" that covers most of the main approaches to creating animals with human traits and personalities in various animated shorts and features. By breaking it down into these four common approaches, I hope to teach my students how to create a set of rules to apply to the way they handle animal characters in their film stories, so that there's a certain logic and plausibility that is maintained in what they're trying to communicate to their audience. And from a purely visual standpoint, I'm also trying to impress upon them where to draw the line between an anthropomorphic animal that possesses human traits, before crossing that line and instead ending up with a "Furry", being essentially an animal's head stuck on top of a fur covered human body. Ideally, an anthropomorphic animal should maintain something of the actual animal's physique, even when walking around on two legs and wearing clothes. 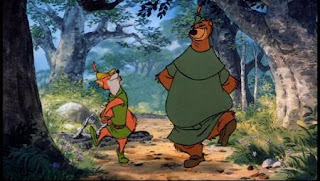 If you look at this still from Disney's "Robin Hood", you will note that Robin himself is still very much a fox on two legs, and that if placed back down on all fours without his costume, he would be very much at home in a film like "Lady and the Tramp" as a caricature of a real fox but with a human personality. Same thing with Little John the bear. When done really well, an anthropomorphic animal character should be initially visualized as a "Human Type", then translating those human physical traits and reinterpreting them in the animal design. I discussed this topic here. 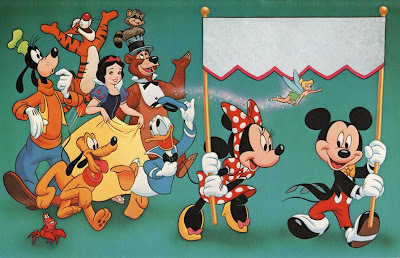 For those of you familiar with "The Country Bear Jamboree" at Walt Disney World, the Disney artists were very successful in creating a cast of bear characters that looked like caricatures of the type of performers one would see on the stage at Nashville's "Grand Ol' Opry". Here is a picture of "Big Al", as an example of what I'm talking about. The facial design and physical body type are very much based on the character's human equivalent, yet never losing sight of the physical design of the actual animal either. For many students, this seems to be rather confusing and a challenge to pull off, while for others it seems to be a very natural, intuitive process. For the uninitiated, just so you have a clear idea of the distinction between what I'm describing here and the aforementioned, dreaded "Furries", here is a link to some Google images of the latter. As you can see, they are more mutant than animal. As a general rule of thumb: If it is embarrassing to look at your animal character when he or she is naked, chances are you've drawn a "Furry"!! Just to solidify the distinction, here is a clip from Disney's "Bedknobs and Broomsticks" that shows how to successfully translate animals into two-legged anthropomorphic characters while still maintaining the animal's physique. I really love this clip, as all of the gags are based on the traits of the actual animals, yet every one of them also conjures up a "Human Type" equivalent as well. Wouldn't you agree that the big ugly rhino puts one in mind of some thuggish, skinhead footballer? Of course, the sleek and agile cheetah is more of the David Beckham type. I was going through some boxes of stuff the other day and ran across some relics from my years in the art department at Walt Disney World. This is the illustration I did for the folder cover that held the 1992 Silver Pass that all Disney cast members (employees) at a certain level would have received. 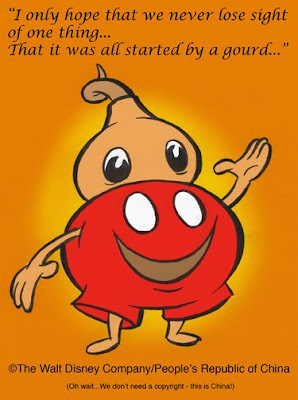 The banner would have been printed in bronze and gold on the passes for other levels. The name of the individual cast member would have also been printed on the banner so that the folder artwork itself was a nice little personalized souvenir for them. Incidentally, these passes enabled the cast members to sign up to three guests into the park, as a nice side benefit of working for Disney. I believe there was some restriction on how often you could do this during the year, however, as some cast members had abused their privileges in the past. Anyway, I thought it was wonderful to be able to treat my family and friends to a day in the parks when they traveled down to visit me in Florida. The original illustration itself was probably about twice the dimensions of this printed piece, and I painted it in gouache on illustration board. Modeling on the characters was all done in a dry brush technique, while the shadows underneath the characters and Tink's pixie dust trail were done with an airbrush - something I used sparingly, as I found it rather unwieldy! This was long before I started using Photoshop, which I find so much easier for creating highly controlled airbrush effects. Mind you, I still far prefer the look of the character art done with real paint. 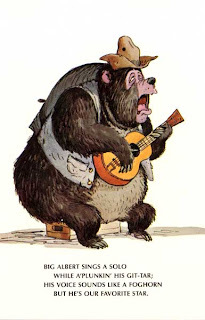 I recall that the most fun part of this particular assignment was getting to draw and paint Henry Bear, the master of ceremonies in "The Country Bear Jamboree", my favourite WDW attraction. Though he may have been a 3-dimensional audio-animatronic character, I wanted to treat him as pure cartoon, like he could have easily existed in a 1940s/1950s Disney animated short, as a close cousin to Humphrey Bear. In fact, I was always disappointed that these bears from that attraction had never been utilized much on Disney merchandise through the years, and had never been portrayed in pure animated cartoon form, especially since the design concept art had all been done by legendary Disney animator and Imagineer, Marc Davis. It's also too bad that Disney didn't adapt them to animation and use that as the basis for the "Country Bears" movie they did some years back, instead of the godawful live-action/costumed crap that they churned out. 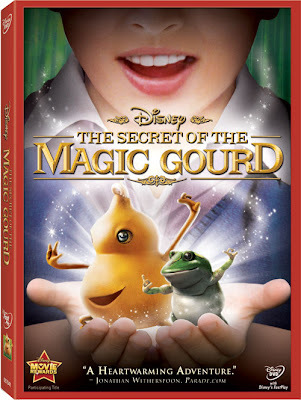 A traditionally animated feature keeping the characters intact in their cartoon design would have been infinitely more satisfying to we longtime Disney fans.